EN71 Safety Approved Kids Wooden Cubby house. Bench Press. Designed for outdoor backyard with door windows and bench. Outdoor Sport. Great space for kids to have fun. Massage Table. Local Pickup Instruction. 70% OFF! Only this Week! Fast Deliver! Top Seller ! Note : Cubby house needs to be assembled. New design kids wooden cubby house. Create an outdoor play area for your kids and inspire their imagination and creativity with ourcubby house. Moreover, the wave roof design allows for easy drainage and expand its lifespan. For sale we have a timber cubby house. It is made from pre-made panels which are easily unbolted to take it apart for transport and includes a deck with verandah and perspex windows. It includes a floor, and the roof is corrugated iron/colourbond. Wooden cubby house with colour bond roof. One window, one door and one sky light. Lined with carpet tiles. On castors so it can be wheeled around. Add another play area for your kids outside. As you can see from the pictures, we wanted a colour that would blend with the backyard but it could be painted as you like. It's not in perfect condition anymore but it's a cubby! Modern Outdoor Wooden Cubby House - Excellent condition. Cubby house pine all over, untreated pine. The front door and side of my house didn’t get sprayed with water when I washed it out. So it’s not paint. A charming addition to your backyard, this cubby house will keep little ones entertained during playtime. Suitable for 2-6 years Cubby house Assembled size: 152cm (H) x 136cm (W) x 97cm (D) Packaged size:116cm (H) x 112cm (W) x21cm (D) Wooden roof Flower box (flowers not included) White trimmed windows Open design with working door Preassembled parts for quick and easy assembly Wooden Instruction Manual Maximum weight: 180kg For family domestic use and is intended for outdoor use only Colour: Brown Warning: Fragile. Handle with care. Follow usage instructions carefully. timber cubby house. Condition is Used. Great cubby, sturdy construction, painted in exterior house paint, roof excellent condition, door has magnetic catch. Floor very solid but need some TLC as per photos. One part of interior is painted with blackboard paint. We have it slightly elevated on cemented posts, could be placed on level cement if desired. Comes apart down to wall size only. External dimensions 2.6m wide, 3.0m deep Inc verandah, 1.95m high at peek of roof. Internal height 1.7 at peak and 1.35 at lowest and verandah. Internal floor 1.75 x 2.3 Verandah 900 x 2.3. Pick up or delivery may be negotiated at cost. Timber cubby house with 1 side and 2 front windows. Colourbond roof with insulation. Can fit onto a trailer. Well looked after 3 year old Kid's Wooden Cubby House is for sale. Material: Treated Pine, Roof: Rubber Slates, Size: 1800mm x 1400mm x 1640mm (at highest point). Before installation and assembly all timber parts were sealed with 2 layers of outdoor timber sealant. The Harper Cubby House is the pefect Cubby for the kids to let their imagination run wild! The Harper Cubby House has the two large opening windows, servery shelf, large front door with window. The Harper Cubby is painted in a NATURAL YELLOW water based stain. The Oscar Cubby House. (Blackboard not Included). The Cubby house must be assembled by an adult/s. The Cubby house needs to be assembled on a solid levelled surface. The screw holes on the cubby house are pre drilled. The Millie Cubby House is a natural timber and has not been painted or stained. But who wants a plain cubby anyway?. Majority of the installation is in the preparation. Don't forget a level surface is a must! The Newport Cubby House is finished in a water base stain (natural colour). But who wants a plain cubby anyway?. The Newport Cubby House is the biggest and most grand cubby house in the Hide & Seek Kids range. Crooked Mansion Wooden Cubby. 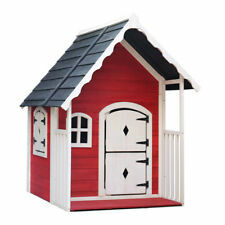 This quality kids playhouse has lots of lovely details, with a little letter box and flower boxes under the windows. Crooked Mansion Playhouse. Total External Depth: 1.2m. The entire house is durable and weather-resistant and a nice front verandah for a bit of shade in the open. Not least, the playhouse looks great too in your garden as well as more backyard escapades for your kids. The little one will enjoy hours of fun in this perfect cubby house, cooking their own food, inviting their friends or maybe spending the whole afternoon in the Verandah. It allow your kids explore a whole new world without leaving backyard.It will be a perfect gift for the little one, they will love it for sure. NEW WOODEN CUBBY HOUSE - NO TOOLS NEEDED! Delivery available Australia Wide! Join theglobal craze and truly make your mark on your Rovo Kids Cubby House - DIY style! Unleash your imagination! Withgreat design and curb appeal to start you off right, the choice is yours, and you can continue to customise your new Rovo Kids Wooden Cubby House as your child grows. Model Warrigal. Includes Sandpit Yes. Includes Slide Yes. Go Easy Online specialises in outdoor fun products with a focus on wheels and motors. Direct Deposit. Product: Create an outdoor play area for your kids and inspire their imagination and creativity with our cubby house. Moreover, the wave roof design allows for easy drainage and expand its lifespan. The versatility provides years of fun. Our efficient design allows for a large sandpit or ball pit underneath the Warrigal Cubby house, with a big 1.8m x 1.9m play area. The timber used for our Warrigal is treated via high temperature drying. Model Warrigal. The versatility provides years of fun. Our efficient design allows for a large sandpit or ball pit underneath the Warrigal Cubby house, with a big 1.8m x 1.9m play area. The timber used for our Warrigal is treated via high temperature drying. Trigger their wildest imaginations with a Rovo Kids Wooden Cubby House! 1 x Rovo Kids Wooden Cubby House. Premium Rovo Kids Wooden Cubby House. Easy to assemble. Colour: Red. Great space for kids to have fun. Timber left unpainted/unstained will deteriorate rapidly in wet weather and the harsh sun. Like any timber product left outside, it must be maintained when required to extend it’s life. Jamie’s Beach House Easy Cubby with extra room and cafe - UNPAINTED. NEW WOODEN CUBBY HOUSE - NO TOOLS NEEDED! - ASSEMBLES IN MINUTES! For the DIY enthusiast our cubby houses and forts are the easiest and best product on the market. THE PLAY HOUSE is a great size if you have limited space in your yard or are looking at an entry level cubby house. It will enhance play and their imaginations. You don’t need to be carpenter or tradesman just need to follow the instructions and have a powered screw driver, ladder & spanner handy. Cubby Houses. Massive Plastic Slide. Why not choose from a range of options and let their imagination run wild! For the DIY enthusiast our cubby houses and forts are the easiest and best product on the market. Our cubbies are made using quality treated pine. Creative play is one of the most important development tools for your children. Allowing your kids the free time to be active participants in their play time, such as painting, dressing up, exploring the outdoors, cloud watching, can help them develop their critical thinking and problem solving skills. One great way to awaken your child's imagination and get them playing outdoors while still having shelter is with the great range of wooden cubby houses available right here on eBay. With their own house to play, explore, build, and have fun, your child will spend hours happily boosting their ingenuity, and the best thing is, you don't even have to leave your house thanks to the wonders of online shopping. Also known as a playhouse, fort, or kids' cottage, cubbies are a fairly unique experience in the Australian lifestyle. A small house for kids typically built in the backyard on the ground or in the garden, they're not be confused with treehouses, which, as the term implies, are typically constructed in a tree. The design of wooden cubby houses may be as simple as a single room with a door, or as elaborate as multi-storey constructions with a slide attached. They're often placed next to a sand pit or swing set for hours of fun for the kids. Ensure the timber used in the construction is appropriate for the weather in your location, particularly if your kids intend to store their favourite toys or small items of furniture in the cubby house. While you're considering the type of wooden cubby house to suit your family, don't hesitate to check out the full range of cubby houses, including the range of Little Tikes cubby houses. Whatever the cubby for your little ones, they're sure to delight in the options available right here on eBay today.